* Coupons are not applicable on 10 for 10 items. 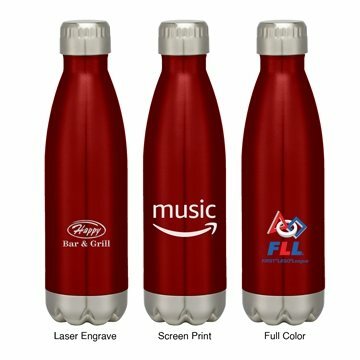 The 17 oz Insulated Water Bottle from AnyPromo is a vacuum sealed bottle with double-wall construction that can keep drinks hot for 12 hours or cold for 24 hours. Available in a selection of 5 different colors with Screen Printing on an imprint area of 2 1/2" x 2 1/2" or Laser Engraving on an imprint area of 1 1/2" x 2 1/2". The 17 oz Insulated Stainless Steel Water Bottle is a customer-voted "Top 100" item because it is a BPA-free and environmentally friendly way to stay hydrated. Not only is this vacuum bottle a healthy choice, it is a great piece of modern drinkware technology. This stainless steel vacuum bottle features a wide-mouth opening to throw in ice and an insulated screw-on lid to prevent spills. If you're looking for a premium giveaway that will be well-received, the 17 oz Vacuum Insulated Bottle may be for you. These cola-shaped bottles are great for corporate giveaways, fundraisers, and events. Great for hot coffee or cold water, this 17oz bottle with wide mouth opening is made of stainless steel. This vacuum insulated thermos features a screw on, spill-resistant lid and double walled construction that will keep your drinks hot for 12hrs or cold for 24hrs. With a similar look to the Swell® bottle, this offers an environmentally friendly alternative to plastic bottles and is extremely easy to clean. Perfect for corporate giveaways, marathons, fundraisers, camps, and more! These vacuum cola bottles are made with stainless steel which is not only durable but BPA-Free and an environmentally friendly alternative to plastic. This vacuum bottle features extremely effective double wall insulation that can keep drinks hot for up to 12 hours and cold for up to 24. This stainless steel bottle features a lid is not only well insulated but screws into a wide-mouth opening that is perfect for accomodating ice. 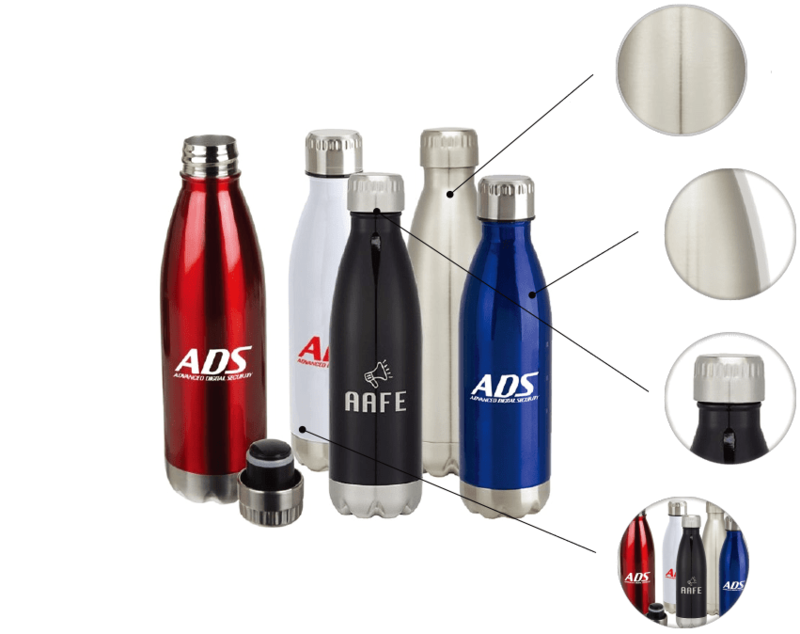 These insulated vacuum bottles are available with a customized 2 1/2" X 2 1/2" screen print or a 1 1/2" x 2 1/2" Laser Engraving on the side of the bottle. NOTE: Product comes with Prop 65 warning label when shipped to California. Label reads: "WARNING: This product may contain carcinogen, which is known to the State of California to cause Cancer and Reproductive Harm. For more information, go to www.P65Warnings.ca.gov. Nice quality, friendly service, very happy with the finished product! I wouldn't hesitate to order from this company again. Great product- we tested a sample against another company's to see which one kept the ice the longest and this one was the clear winner! Our logo looks amazing on the blue bottle! The bottles are nice and durable. The logo I requested on the bottles was perfect! I will use Any Promo for all my organization's needs!